To analyze the reception of international judicial decisions by French domestic courts, as always, is no easy task. This is not because French courts completely ignore international decisions on human rights or refuse to recognize their reach and effects in the national legal order. The difficulty is threefold and lies in the way (1) French law defines the relationship between international law and the domestic legal system, (2) the French judicial system operates, and (3) the courts formulate and state the reasons on which they base their adjudicatory acts. The picture of the reception of international judicial decisions by French courts is furthermore “blurred” by the work division that the latter established between themselves. In that regard, the present report will analyze the case law of the Constitutional Council (Conseil constitutionnel), the Court of Cassation (Cour de cassation) as the supreme court of the judicial legal order, and the Council of State (Conseil d’Etat) as the supreme court of the administrative legal order. 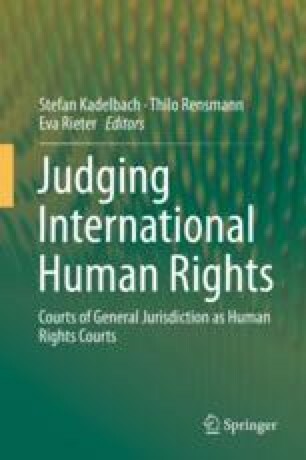 It shows that even though the tribunals hardly ever refer explicitly to the practice of international bodies, the latter are not totally absent from their reasoning. Thus, besides the explicit and obvious mentions of international practice in national judgments, one must look for indirect and implicit references by taking into consideration the influence that is exerted in an informal manner and that cannot be quantified otherwise than through knowledge of the national case law and of its evolution. The authors would like to express their profound gratitude to Prof. Emmanuel Decaux who entrusted them with and reviewed an early draft of this report. They however bear sole responsibility for the final version.